ILIGAN CITY — Emotions ran high among the Muslim Maranao evacuees as they assembled Thursday (July 27) morning at Mindanao State University in Iligan. They formally announced the formation of their survivors’ group called Tindeg Ranao (Rise up Ranao) amid reports that authorities forbade them from joining such groups. In their first assembly, they emphasized their longing to be allowed to come back home to Marawi sooner than later and toward that, for the fighting to end there soon especially the aerial strikes. “I just want to say to President Duterte, it’s not the Mautes who are being bombed. Not all Muslims are terrorists. It is us who are getting abused,” Asliah Ampuan, 25, said at the first assembly of Tindeg Ranao (Rise Up Ranao). Ampuan was overcome with emotions before she managed to say this before the gathering of fellow Marawi evacuees. Over 400,000 residents of Marawi were forced to flee the country’s lone Islamic City between May 22 to May 26 after an armed conflict erupted between the government troops and the extremists Maute group. The conflict was the immediate justification used by President Duterte to impose martial law over the entire Mindanao. It made it easier for the government soldiers to make warrantless arrests, enter and search private dwellings without warrants, impose ID requirements and above all deploy greater firepower including daily aerial assault in the area. Evacuees in at least two large evacuation centers in Iligan told Bulatlat they left their houses and properties in a huff, many with just their clothes on. They left their money and food and clothes believing they’d be returning soon enough. They thought the fighting would take only two or three days, maximum of seven days, the usual to them. Many said it was the military who told them to leave Marawi. Evacuees who live near where the black-clad armed and masked men first holed up opted to leave rather than be forced to accept arms and fight for the Maute leaders. Some evacuees, like Noraisa Arumpac, 42, a graduate of midwifery and storekeeper in Marawi, said they were asked to leave by armed masked men in black. She didn’t recall them introducing themselves. She just assumed they were with the Maute group or Isis. She said these armed men just told them to leave the area because soldiers were coming soon and there would be armed hostilities. As they joined the throng of residents leaving Marawi, they heard from an armed man clad in black, aboard a truck with covered up conduction sticker and plate number, that by May 26 they all should have departed from Marawi. Another family in a different evacuation center said they spotted 17 armed black-clad Maute Group taking positions on May 22. They live higher and from their vantage point, they could see the arrival of the black-clad men below them. But they did not immediately leave thinking any would-be fighting between Maute group and the soldiers would take just a few days. They left on May 26 when a bomb fell near their house and the children got scared. That the fighting dragged on for over two months, and the government employed aerial strike damaging much of Marawi, have shaken many of the evacuees. They are rido-resistant (rido means clan war). But an evacuation this long, and daily aerial assault that leveled many of the low buildings and houses, these were unprecedented. “This is not the change we expected when we voted for President Duterte,” teary eyed Ampuan told the assembly of Tindeg Ranao. “Sana ibasura na ang martial law. Ang solution ay pagbabago.” (Let’s hope martial law will be junked. The solution is to have change), she ended. Her friend Siittierahma Adjiasim, 32, expressed gratitude to the mayor of Saguiran in Lanao del Sur “for wholeheartedly accepting” the evacuees. Over a thousand Maranao families are in separate evacuation sites in the city. A day before, the relief convoy of the National Interfaith Humanitarian Mission (NIHM) 2 to Saguiran reported a repressive atmosphere there. Glenn Philip Aquino of Kalinaw Mindanao told Bulatlat they were waylaid for almost an hour by the soldiers at the checkpoint. Each delegate was told to register their name in a logbook. They were searched, their pictures were taken, before they were allowed to proceed. This, even if they were with personnel of the Department of Social Welfare and Development (DSWD). Aida Ibrahim described their newly formed Tindeg Ranao as an organization of Marawi evacuees. Over the past month, the evacuees gathered together to share experiences and hope and make their voices heard, she said. They broke their two-month long ‘silence’ when they held a rally in Iligan last July 22, and when they gave a state of the nation address of the bakwits last July 24 at Iligan City Plaza. It is not true that there are no human rights violations in Marawi as repeatedly claimed in the runup to President Duterte’s request to extend Martial Law. According to Karapatan and Ranaw Rescue Team, there are many cases that should be investigated. What is hindering this, they said, is the military’s control of Marawi. “They would say there are no cases but they won’t let us in to investigate. They say ‘there are no documented cases, no cases, no cases.’ We say ‘let us in, let us in, let us in,” said Samira Gutoc- Tomawis of Ranaw Rescue Team at the survivors’ assembly. She condemned the arbitrariness of claims and decisions being taken by the military. By now talks among the Marawi evacuees center on questions why the military is taking an inordinately long time to “clear” Marawi of its target Maute group. The military has offered a changeable number of estimated ‘enemies.’ Tibo Baraamal, 31, a construction worker in Marawi, said that from his house, he and his wife saw the arrival of Maute Group. He said 17 passed by their house to take a position at a checkpoint on May 22. They saw how helicopters dropped bombs on some of the Maute’s positions. He said the talk among the Maranao is that the Maute Group has at most only 200 fighters, including some who looked like foreigners. So, their question remains: why is it taking too long to “clear” Marawi? Baraamal and many other Marawi evacuees couldn’t say where the Maute’s, if they were still alive, were getting reinforcements. They said the military has surrounded Marawi with checkpoints. When members of NIHM 2 asked Bedjoria Soraya A. Adiong, ARMM provincial Governor, during NIHM 2’s courtesy call on Friday, July 28, the governor’s answer was also based on the military report. According to her administrator, Juraira Alonto, the government troops are battling snipers who have been frequently changing locations. 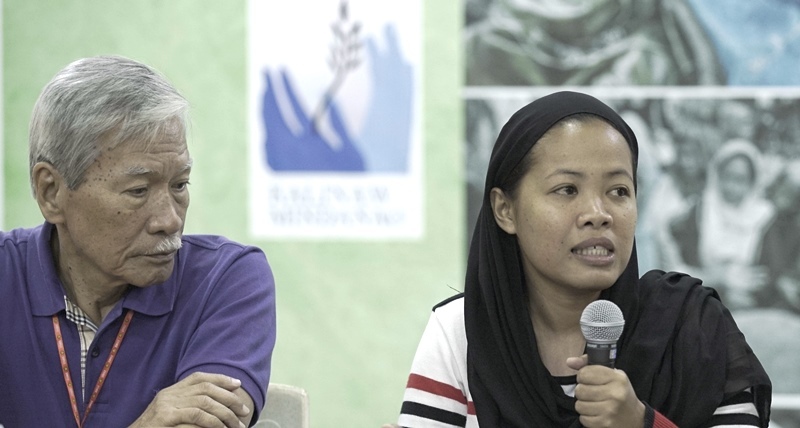 At the Tindeg Ranao assembly, Ibrahim repeatedly emphasized the evacuees’ desire to go home soon not only because they feel the conflict should have been mopped up by now or even earlier. She cited the bigger number of forces and superior arms sent in by the government. She said another reason why they urgently wish to go back home soon is their worry over possible threats of dislocation via “rehabilitation” and other plans such as the expansion of plantations and promoting eco-tourism. Bayan Muna’s Satur Ocampo expressed hopes the NHIM2 can help the Marawi survivors to document what happened to them and seek accountability and justice. 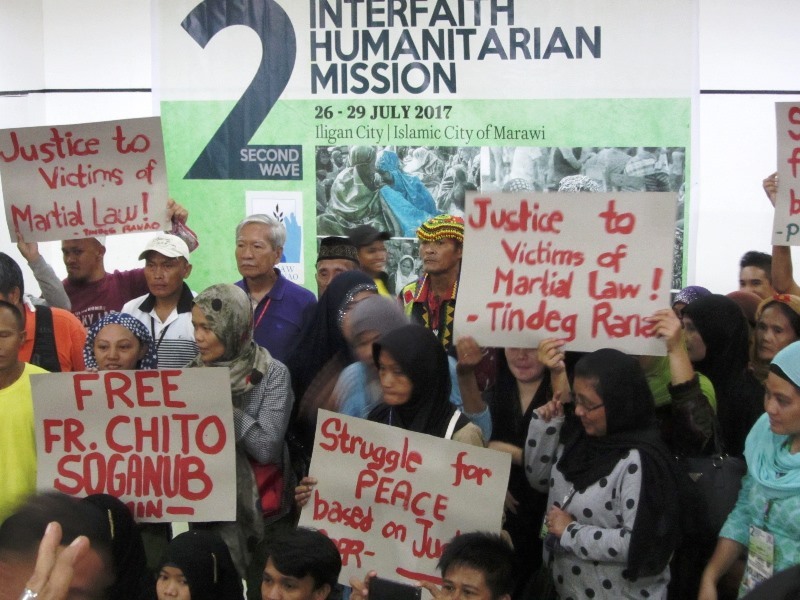 “In joining the second interfaith mission, I wished to help clarify the proper response of the people of Marawi,” Ocampo said. The NIHM 2 observes the prevalent questions on the factual grounds for the declaration of martial law and the type of warfare introduced by the AFP, the artillery and aerial assault which are also being done in the entire area of Mindanao. Whatever rebuilding is in store, Ocampo said the survivors should have a big say in it.